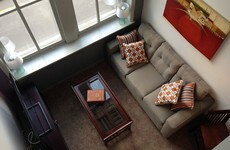 1 Bedroom, 1.5 Bath True Downtown Loft, Walking Distance To Everything! True two-story loft in the heart of Downtown Nashville, overlooking the Titan’s Stadium and the Cumberland River! Your loft reservation will include: secure key code access to the building and the unit, non-smoking bldg, cable and wifi provided, fine linens in a fully furnished private residence right on 2nd Ave. Once you arrive, you are within walking distance to most of downtown and you can Uber everywhere else! Looking for a Getaway? Then BookIt! Nashville has the vacation rental you have been looking for, ready at your fingertips. Be sure to check out our photos of all the sights and sounds that can be seen and heard, just around the corner! Nashville has a thriving downtown community with something for everyone. Whether you are looking for sporting events, shopping, museums, a grocery store or a pharmacy for that last minute item, a quick cup of coffee or a nice glass of wine, a major concert venue, the symphony, a broadway musical, or just a local honky-tonk band, Nashville has it all and it is just steps away from our Condo at The Quarters, located on 2nd Avenue. Just click the BookIt Now button to secure your reservation. Our Downtown Hideaway is just that, a condo in the heart of Downtown Nashville that feels like a hidden gem. It is a two-story, true loft with 20 ft windows overlooking the Cumberland River. You can see it all and still feel removed from everything because this 100 year old building is just that quiet and peaceful. We have a Queen bed in the upstairs bedroom that overlooks the living room which has a Queen sofa-sleeper, 1 and a half baths, and a fully stocked kitchen for your entertaining needs. Our loft is in the heart of it all and yet still hidden away from it all at the same time! It is a fully renovated condo that is ready for your weekend getaway, girl’s night out, or family gathering. The building is a residential property, so you will feel this is more like a home than a hotel. The building is a secure building with electronic access only available to residents and our guests and the unit as well, has a convenient combo access for our guests; prior to arrival, you will receive instructions on how to access both the building and the unit. Parking is available just around the corner whether you prefer a lot or garage parking, just park your car and walk to everything… Printer’s Alley, Titan’s Football, TPAC, Country Music Hall of Fame, the Music City Center, the Schermerhorn Symphony Center, the Frist, The Ryman, Tootsie’s Orchid Lounge and countless other possibilities are all at your fingertips!